Great entry, Norris. It’s interesting to note that Marvel executive editor Tom Brevoort recently described the creation of Nick Fury on Marvel’s website, and it aligns with Kirby’s version rather than Lee’s deposition version. Nice article Michael. I’d actually forgotten about that story and can see how Kirby may well have drawn on elements of the Midnight Monster character. I guess we can never know the true origins of the Hulk, but have you heard the assertion by Arlen Schumer that it originated with an idea by publisher Martin Goodman? 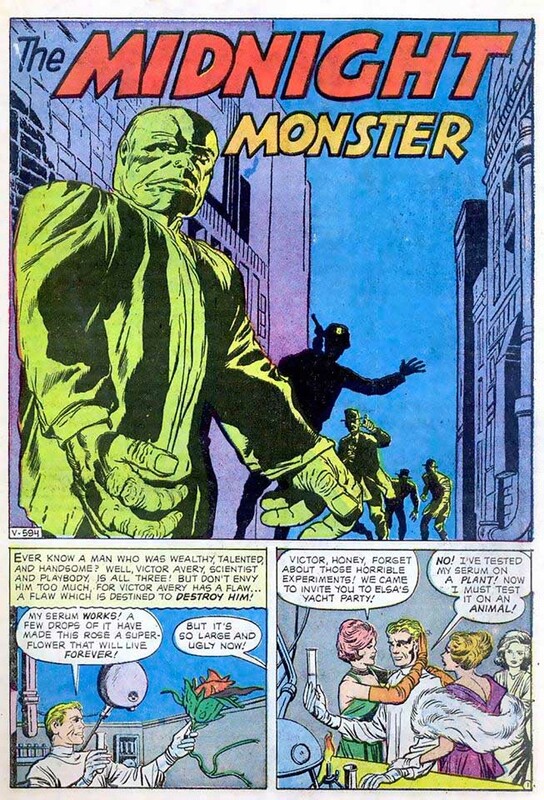 According to Schumer, Goodman asked for a ‘super-Frankenstein’ to capitalise on a then-popular Frankenstein toy and this is why Kirby’s design is uncannily similar to the (Universal-inspired) toy packaging images. I wasn’t able to get a source for this from Schumer, but if you (or any readers) know one I’d really appreciate a response. (Schumer also states Stan Lee’s original name for the ‘Fantastic Four’ was the ‘Fabulous Four’…I’m likewise seeking any reference for this). Speaking of Lee, he once recalled the Hulk as Marvel’s attempt to capitalise on the most popular member of the FF (i.e. the Thing) and wrote that he asked Kirby to come with a ‘sympathetic monster’. This has some logic and doesn’t necessarily contradict Schumer, as the original request still could have come from Goodman. In bringing the character to life it seems Kirby or Lee (or both) channelled the old ‘Heap’ character who had a similar ‘anti-hero’ status (even fighting a team of superheroes at one point) and apparently a teen side-kick. It’s interesting to note that, in some interviews, Lee has mentioned liking the name ‘Hulk’ as it reminded him of the ‘Heap’. 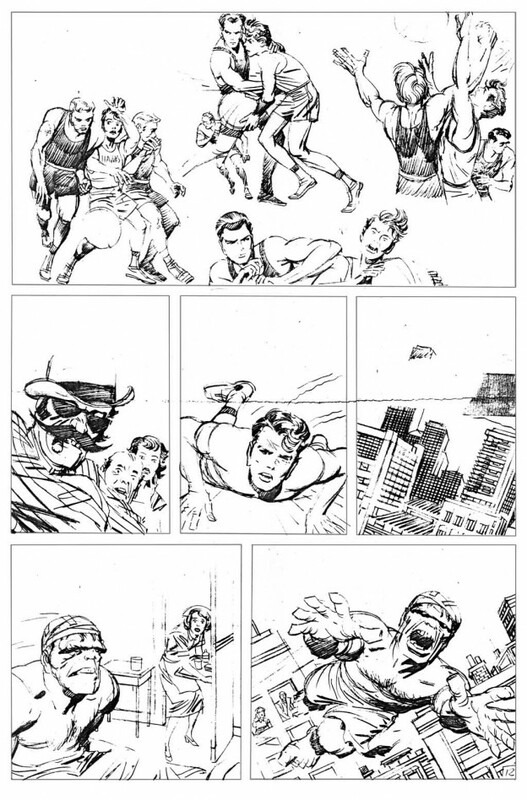 The example of Lee rejecting the early Hulk pages fits very well with various accounts (e.g. by John Romita and Roy Thomas and Lee himself) of Lee being surprised by what Kirby had added after initial story discussions. In this case it seems Lee didn’t approve of an element (or elements) and perhaps requested a re-draw. Similar situations were repeated and witnessed on various occasions over the years. 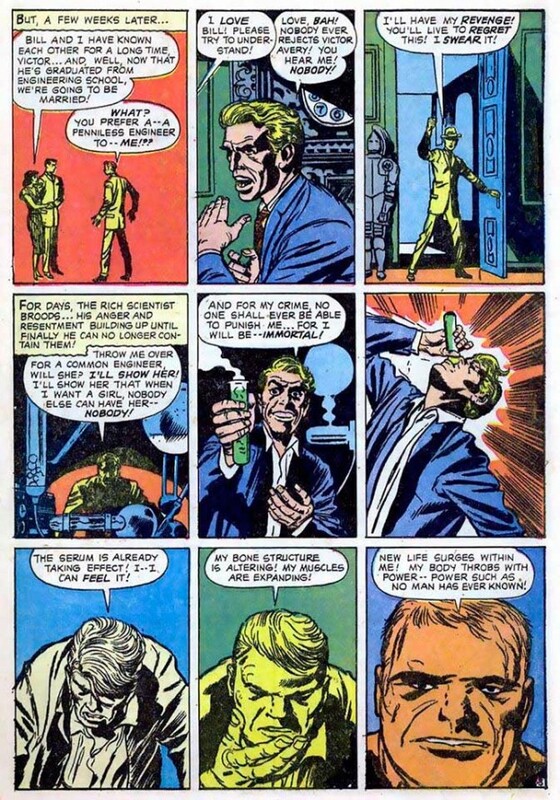 Some other obvious examples of Kirby’s creative contributions on the strip would be the re-use of the ‘Circus of Crime’ idea and (more speculatively) an apparent attempt to imbue the Hulk with the power to fly following a trip into space in the third issue. 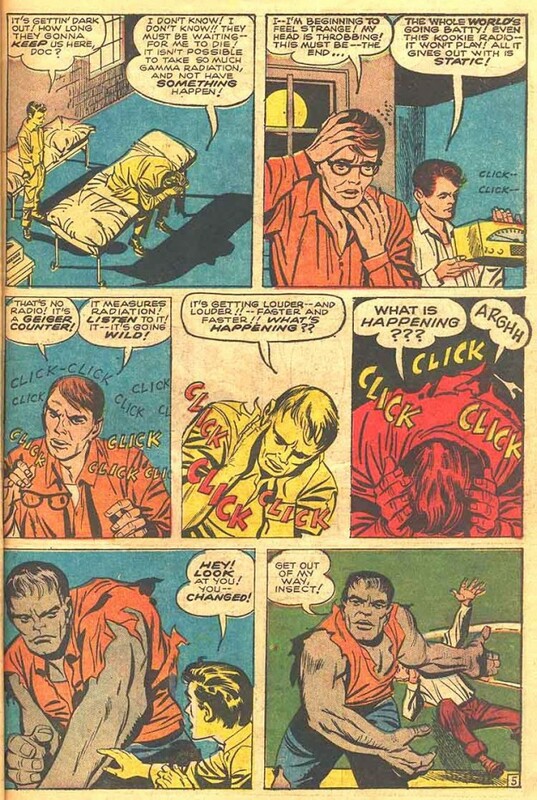 Looking at Kirby’s pictures (and ignoring Lee’s contradictory script) it seems apparent to me that the original intent was to add this ability together with a psychic link to Rick Jones (which also proved a dead-end idea). Rather than leaping and appearing to fly (as Lee describes in his script) the Hulk is clearly swooping down out of the sky in some scenes (e.g. to scoop up Rick Jones) and changing direction in mid-air. Kirby possibly thought the Hulk needed this means of propulsion to allow more changes of locale. (PS: this was something we discussed in a thread on the Marvel Masterworks site). Perhaps this aspect was discussed prior to Kirby drawing the story, but perhaps not. Lee is on record several times as stating he disliked the idea of a character who could fly without any apparent means of propulsion. It’s interesting that the rejected pages seem to include this flying Hulk as well as the psychic link, both elements that would be quickly dropped. Would Kirby have tried to radically alter the Hulk character so early, without mentioning it to Lee in advance? It’s difficult to say. I recently re-read the Kirby and Lee interviews from the silver age (as well as various interviews from the sixties Marvel artists) and other contemporary documentation. There is a very consistent picture of Kirby/Lee discussing the plots beforehand, with each contributing ideas as early as 1962 (which explains the occasional re-use of ideas/scenes from earlier Kirby strips). Kirby notes in at least one interview that he wouldn’t make certain decisions (e.g. putting Captain American in Vietnam) without Lee’s approval. However it is equally clear that Kirby would add many elements to stories that he hadn’t discussed with Lee, particularly as time went on. A few years back Lee even mentioned that Kirby added the X-Men’s famous ‘danger room’ to the first issue of his own accord. Thanks for the comments Rosco. A good deal of food for thought here. The Frankenstein plastic model connection is certainly plausible. I bought that when it came out along with Wolfman, The Mummy and the Creature From the Black Lagoon,( I don’t think there was a toy) By the way, I expanded a bit on this particular blog entry in the upcoming issue of Jack Kirby Collector, due out shortly.